The model CPD8500 digital dead-weight tester is an instrument that combines the performance of a manual pressure balance with the efficiency and usability of a compact digital primary standard. The instrument offers a broad pressure range with various measuring heads from 1 ... 500 bar (15 ... 7,250 psi) and 1 ... 20 bar abs. (15 ... 290 psi abs.). 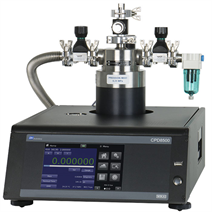 The CPD8500 digital dead-weight tester is equipped with an internal environmental monitoring module, a head temperature probe and a precision vacuum sensor for automatic detection of sensitive parameters. An optional internal or external barometric reference provides additional flexibility for the measurement of gauge or absolute pressure ranges. Accuracies as high as 35 ppm of reading make the CPD8500 comparable to a reference primary standard and an ideal tool for calibrating transfer standards. In absolute mode, the CPD8500 offers continuous measurement, unlike a traditional piston gauge where vacuum is interrupted to load masses. This makes the instrument an easy and fast solution for premium calibrations. The internal automatic lubrication system drives higher and lower pressure ranges without the need for an additional pressure supply, limiting contamination and enhancing the piston-cylinder system performance. The CPD8500 utilises proven piston-gauge technology with a high-accuracy load cell for precision calibration without the need to load any external mass sets. The displayed pressure value is internally compensated for changes in ambient conditions, local gravity and piston-cylinder temperature. This eliminates the need for manual or external complex calculations. 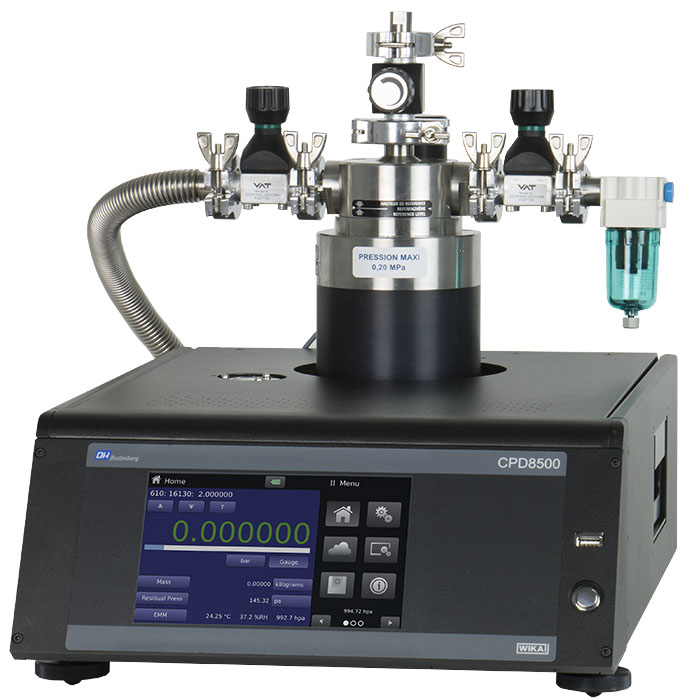 The CPD8500 base instrument has integral leveling feet for easy leveling. The feet are padded to reduce vibrational effects. The instrument also supports full backward compatibility to the absolute and gauge measuring heads of its predecessor, CPD8000.